astigmatism. While some people enjoy making a fashion statement with eyeglasses, others prefer their appearance without them, especially in India, young women do not like to wear eye glasses. Contact lenses can achieve this without irreversible refractive surgery. Contact lenses can also provide a full field of unobstructed vision, which is great for sports. Contact lenses, like eyeglasses or LASIK, can correct your farsightedness and Contact lenses have been around for more than a hundred years. During that time, many advancements have allowed just about everyone to wear contact lenses. If you were told in the past that you couldn't wear contact lenses, odds are that’s not true today. There are more convenient and healthy contact lens options than ever. If you’re new to contact lenses, your first step is to see an eye doctor. Contact lenses must be prescribed and properly fitted by an eye doctor. Your doctor will evaluate your visual needs, your eye structure, and your tears to help determine the best type of lens for you. Soft lenses are made from gel-like, water-containing plastics called hydrogels, and cover the entire cornea. Silicone hydrogel contact lenses are an advanced type of soft lens that transmit more oxygen to the eye than regular hydrogel soft lenses. GP lenses, also known as RGP or "oxygen permeable" lenses, are made from rigid, waterless plastics and are especially good for presbyopia and high astigmatism. GP lenses are smaller in diameter and often provide sharper vision than soft lenses. 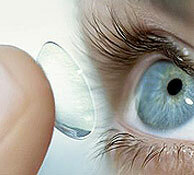 Silicone hydrogel contact lenses are the most popular lenses in the recent times. What lens replacement frequency is prescribed most often? Toric contact lenses correct for astigmatism, as well as for myopia and hyperopia. Contacts for dry eyes. Are your contacts uncomfortably dry? 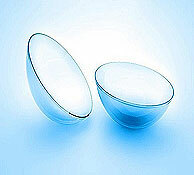 Certain soft contact lenses are specially made to reduce the risk of contact lens-related dry eye symptoms. [More about contact lenses for dry eyes. Colored lenses. Many of the types of lenses described above also come in colors that can enhance the natural color of your eyes — that is, make your green eyes even greener, for example. Other colored lenses can totally change the color of your eyes, as in from brown to blue. Prosthetic lenses. Colored contact lenses also can be used for more medically oriented purposes. Opaque soft lenses called prosthetic contacts can be custom-designed for an eye that has been disfigured by injury or disease to mask the disfigurement and match the appearance of the other, unaffected eye. First, your contacts must address the problem that is prompting you to wear lenses in the first place. Your contact lenses must provide good vision by correcting your myopia, hyperopia, astigmatism, or some combination of those vision problems. Second, the lens must fit your eye. To do that, lenses come in tens of thousands of combinations of diameter and curvature. Of course, not every lens brand comes in every "size." Your Ophthalmologist is skilled in evaluating your eye's physiology, and your eyesight, to determine which lens best satisfies the two criteria above. When you and your doctor decide on the right lens for you, you'll be given a contact lens prescription. You'll be able to buy a supply of lenses from the hospital. Caring for your contact lenses — cleaning, disinfecting and storing them - is much easier than it used to be. Today, most people can use "multipurpose" solutions - meaning that one product both cleans and disinfects, and is used for storage. Of course, you can avoid lens care altogether by wearing daily disposable contact lenses. Also, the correct "parameters" of your lens — that is, power, diameter, and curvature - can be finalized only after you've successfully worn the lens. This is especially true for more complex fits involving extra parameters, such as with bifocals or toric contact lenses for astigmatism. Today, more contact lens choices than ever are available to provide comfort, good vision, and healthy eyes. If your eyes or lenses are uncomfortable or you are not seeing well, remove your lenses and visit your eye doctor to explore available remedies for contact lens discomfort.